Just five years before Nazi Germany’s invasion of the USSR, the construction of a giant new tank factory was complete. Uralvagonzavod provided a strong production base for hastily evacuated factories from the Soviet Union’s European part. A decision by the Soviet government in the early 1930s to extensively revamp the industrial district of the Urals would prove to be timely. As plans for the new center took shape, local iron mines and blast furnaces were to produce raw material for new machine-building enterprises fitted with equipment that was bulk-bought from leading foreign companies. The authorities decided to build the country's largest railway carriage factory near the town of Nizhny Tagil. Building the cars was a laborious process that required advanced technology, skilled craftsmen and high quality raw materials, and since rolling stock was classed as a strategic resource, the Urals wagon plant (Uralwagonzavod) was founded as a key enterprise of the Soviet Union. This major investment of resources quickly yielded results. Having purchased most of its rolling stock abroad before the 1917 revolution, with the lightning completion of the new plant in 1936 Soviet Russia suddenly emerged as one of the largest world manufacturers of railway equipment. In the five years before the Nazi invasion of 1941, Uralvagonzavod produced more than 35,000 carriages, consistently beating the combined output of all other equivalent Soviet plants throughout the 1930s. However, in addition to the company’s main profile it had the additional task of serving as a ready platform for the rapid creation of industrial facilities in any location, from the production of concrete and electricity to communications. This concept was exactly what was needed in 1941, when the German-led invasion of the Soviet Union threatened the destruction or capture of the nation’s entire industrial capacity in the European part of the country. The loss of the Soviet defense plants would have been disastrous, so work began in the opening weeks of the war to dismantle and evacuate dozens of industrial enterprises to the Urals and Siberia, where they would be mainly turned over to military production. In August 1941, the Urals tank factory, one of the world’s largest, was created on the basis of Uralvagonzavod and 12 evacuated enterprises. Within two months, workshops that previously built railway cars had switched to production of tanks. Altogether from 1941-45, the Urals plant built 25,000 armored vehicles for the Red Army, more than the total number produced by all of Germany’s factories in this period, and including half of the legendary T-34 battle tanks manufactured in the war years. Overall, the Urals region turned out nearly one third of the Soviet armored forces used in the war, as well as secondary products like aerial bombs, artillery carriages, metal aircraft fuselages, and also automobiles, which were another invaluable resource in military operations. After the war’s end it was decided not to relocate the evacuated facilities back to their original site. Instead, Ukraine and European Russia built new factories while Uralvagonzavod retained its status as the country's largest defense plant. Over its years of intensive work it gained unique experience in the design, construction and maintenance of tanks. 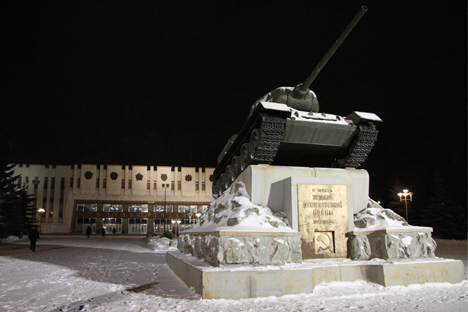 These facilities became the nucleus of the Soviet school of tank building, one of the strongest in the world, and it was in Nizhny Tagil that the design strengths of the T-34 were developed in the subsequent T-44 and T-62 tanks. In the 1960s and 1970s, Uralvagonzavod engineers developed and produced the T-72, the largest armored vehicle of its time, which today remains the backbone of the armored forces of many countries. While the Urals plant never forgot its origins, and kept supplying the Soviet and Russian railway network with new carriages, the name Nizhny Tagil is primarily associated with tanks. Since the 2000s, Uralvagonzavod has made a double breakthrough in tank building. First it launched production of the new T-90 tank, equipped with a fully-stabilized 125-mm smoothbore gun that also fires anti-tank guided missiles, and which is also fitted with advanced optics, electronic warfare systems and reactive armor. But the main achievement of the Urals tank builders was the successful creation of the Armata, a fundamentally new type of tank-based universal platform, which is unrivalled in many aspects of its design. In total, Uralvagonzavod has built more than 100,000 tanks since 1941, making it the world's largest producer.